It has been 11 years since the towers fell on 9/11. Many of us remember where we were when we heard the news and saw the footage. I was pastoring in Randville, Michigan at the time. I was chopping wood for an older couple in the church when the wife me out and told me what was happening that morning. That event and the aftermath certainly got the attention of the people of North America. There was a great deal of interest in the Lord at that time (though maybe it was just a desire for a sense of security in a world gone mad). Although there was significant religious fervor for several months after 9/11, I do not believe that there was a lasting impact on the nation in terms of commitment to Christ. 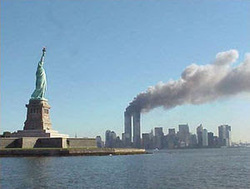 If this was not an event that lead to revival, what ought we to think about 9/11? “There were some present at that very time who told him about the Galileans whose blood Pilate had mingled with their sacrifices. And he answered them, ‘Do you think that these Galileans were worse sinners than all the other Galileans, because they suffered in this way? No, I tell you; but unless you repent, you will all likewise perish. Or those eighteen on whom the tower in Siloam fell and killed them: do you think that they were worse offenders than all the others who lived in Jerusalem? No, I tell you; but unless you repent, you will all likewise perish.’ ” (Luke 13:1-5 ESV). In my opinion, this is the takeaway from 9/11 – repent. When we see tragedy, we miss the mark when we ask the why question. In most tragedies, God would have use ask, “What do I deserve? Are there things in my life for which, if God expressed justice, I would be condemned?” When we ask those questions and recognize our own sins, our response should be to repent. I like to define repentance as a change of thinking that necessarily leads to a change of action. There is a godly sorrow for sin that leads to life through repentance. However, there is a sorrow for sin that refuses repentance which leads to death (Cf. 2 Cor. 7:9). Take the occasion today in remembering 9/11 to examine your heart and your life. When the Spirit points out sin in your life, sorrow, but sorrow with repentance. Blaine is the President of the Fellowship. He loves the Scriptures and to encourage people to experience the fulness of what God wants them to be both as servants of Jesus Christ.